It’s that time of the year when gratitude is top of mind and in our hearts. 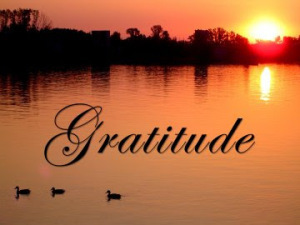 For me – and many others – gratitude is a year-long affair. A few years ago, I became a contributing author (among hundreds of others) in a book called “Celebrating 365 Days of Gratitude”. Each co-author submitted a very brief story that spoke of their gratitude. My story touched on a variety of things in my life that I was grateful for. Mostly, I was grateful for having the gift of gratitude. Gratitude amplifies the good; balances out the not-so-good; and gives our lives more meaning, purpose and pleasure. In our busyness we often rush by the good in life – whether it be a situation, a micro-moment or something else that deserves to be noticed and savoured. So here’s a call-out to each and everyone of us: let’s pay more attention, notice more of the good, create more good by giving thanks to others, and reap the rewards of a more grateful, richer life. 1) Boost Your Well-being: If you want to be healthier, happier, and more successful you would be wise to ramp up your Gratitude Attitude. The character strength of Gratitude has been scientifically proven (many times over) to boost your mental, emotional and even physical health. 2) Giving Thanks Daily Improves Your Daily Life Experience: Setting the intention to notice and appreciate the good in life helps you notice more of the good. This intention is like inserting a GPS in your brain, heart and soul to detect the good. As such, you bring more good into your life by being aware and present. 3) The Giver of Gratitude Often Experiences Even More Than the Recipient: Receiving thanks is wonderful. But giving it can be as powerful – and sometimes even more so. People who learn to express thanks more often to others begin to experience greater well-being (emotionally and even physically). 1) Make it a Daily Habit: Don’t wait for Thanksgiving to roll around (once per year). Express gratefulness every day. Even in tough times, there is always something to feel grateful for. If you set the intention to find those nuggets, they will appear – and this noticing and appreciation will enrich your day. 2) Start a Gratitude Journal: Each day write out at least 3 things you are grateful for. Make sure you capture this in writing in some form because you can also replay and savour the gratitude moments by reviewing past entries. Some people are starting gratitude challenges on Facebook. Not a bad idea at all…get others doing this with you can be all that more powerful and generous and act. 3) Say Thank You More Often: That ‘thank you thing’ comes easily for some but can be less so for others. Whether it comes easily or not, do it anyways. Saying thanks can boost someone’s day (receiving gratitude is powerful) – and giving it can boost your own too. Get in the habit and you will be grateful that you did.